On a recent weekday evening in south Mumbai, the Central Telegraph Office (CTO), a stone’s throw from the raucous Flora Fountain traffic circle, is abuzz with noise—not of customers but carpentry work. CTO, one of the district’s many heritage buildings with solid stone facades, humbly stands in the shadow of the considerably taller Mahanagar Telephone Nigam Ltd (MTNL) office behind it. The MTNL office itself is overshadowed by the even taller and more imposing Videsh Sanchar Bhavan tower next door that houses VSNL offices. The three form a pecking order of telecom offices—from the swanky Tata-owned building at one end to the sad, sorry old CTO at the other. Finding the telegraph counter in CTO means walking through an unmanned metal detector, past a dark, gloomy foyer, which is being converted into what looks like a modern bank with counters and glass partitions between them, and into a narrow corridor on the right. “The telegram business has gone down a lot. Before, we used to send 1,000 a day. Nowadays, we get 100, sometimes 200," explains a portly man behind the counter with a smile on his face. He counts the words on the filled-in form handed to him, checks on a laminated sheet of paper for the charges—Rs26 for overnight delivery of a 22-word telegram to Delhi—and then he hands back a counterfoil. But when he checks the billing machine at the counter, he looks a little embarrassed. It was a few minutes past 5 in the evening, the end of a working day, and the Mumbai CTO had only sent 37 telegrams the whole day. Visibly upset, he quickly says: “We will send more today. We are open 24 hours for your service you know. Maybe some more people will come." In all likelihood, however, they won’t. After more than 150 years of service, and often immortalized in film and fiction, the Indian telegraph system is losing out to newer means of communication. While investments and technology innovations are still forthcoming, demand for the service has dropped dramatically. And even long-time employees of the telegraph system believe the history of the telegraph in India, which began in 1833, is slowly drawing to a close. In 1833, a young Irishman of meagre means was sent to India as an assistant surgeon in the East India Company. At the time, it was unusual for someone like 24-year-old William Brooke O’Shaughnessy, a doctor from a poor family in Limerick, to be picked for the plum assignment. His greatest contribution to the annals of Indian history was to come in 1850, when he was appointed by the Company to string up the country’s—and indeed Asia’s—first telegraph line between Kolkata (then Calcutta) and Diamond Harbour in the city’s suburbs. At a length of just 27 miles (43.5km), the line might seem like a humble beginning. But remarkably, the “official" Kolkata-Diamond Harbour line had been preceded, a decade earlier, by O’Shaughnessy’s own private and experimental line of 21 miles. Sitting in a corner of the country, thousands of miles away from Samuel Morse in the US and English telegraph pioneers William Cooke and Charles Wheatstone, the doctor had developed a telegraphy system of his own. O’Shaughnessy’s initial designs were unique and called for messages to be received by imparting a series of electrical shocks to the operator—thankfully, he would import and adopt more conventional methods in time. But it would take 10 years and the patronage of governor general Lord Dalhousie before his ideas were taken seriously. Success was instant. By 1856, the network had expanded to 46 receiving stations. “The First War of Independence in 1857 failed because of this telegraph technology. Lord Dalhousie once said that the telegraph saved India," says C.V. Gopinath, who recently retired as senior deputy director general of telegraph services and ex-officio additional secretary to the government of India after 40 years of service. Gopinath, one of the first qualified engineers to join the department, is proud of the service rendered by the telegraph network. “After the war in 1857, and even after the telephone system was aunched in India in 1882, the telegraph remained the most popular system of communication." According to David Arnold’s book Science, Technology and Medicine in Colonial India, by 1939, India had 100,000 miles of telegraph lines carrying 17 million telegraphic messages a year. Arnold says in the book, which was published in 2000, that while the system was adopted early on by the colonial military, “by the early twentieth century neither government officials nor nationalist politicians seemed able to function without a daily diet of telegrams". Therefore, in the early years after Independence, India had already developed into a powerhouse in terms of telegraph traffic. In 1953, on the occasion of the centenary of the Indian telegraph system, the posts and telegraph department published a book called Story of the Indian Telegraphs: A Century of Progress. Authored by Krishnalal Shridharani, the book paints an optimistic view of the future of the telegraph in India. At the time, Shridharani says in a section called The Superlatives, the Indian telegraph department had the sixth largest inland traffic in the world and third longest mileage for telegraph transmission. And the book is confident about the system’s ability to grow, improve and take its services to the citizen “to his door in the remote village". However, the telegraph, after a flurry of activity in the 1980s, would eventually fail to live up to the promises of the first hundred years of its existence. During the golden years of the 1980s, when the telegraph service was at its peak, “more than 100,000 telegrams per day were sent and received only in the Delhi main office. Now, it’s barely 100,000 a day, nationally," says Deepak Sinha, general manager, telegraph services. Sinha works out of the CTO in Delhi. Situated on the Capital’s arterial Janpath, the office is housed in Eastern Court, a courthouse during the Raj era. Echoing Sinha’s sentiment is Suranchal, who joined the services as a telegraphist in 1983. Suranchal, who goes by only one name, remembers the time when a telegraphist’s job was both prestigious and difficult to get. “Earlier, all telegraphists had to undergo a training for nine months before they would be put on to the machines. And an applicant had to get at least first division in their matriculate exams. At that time, getting more than 60% was a huge thing." Currently, Suranchal works as the personal assistant to R.P. Gond, chief superintendent at CTO in Delhi. “Now, there is no more work," she says. A far cry from the days when telegraphists used to compete with each other to send telegrams. “During the 1980s and 1990s, we had to complete a quota of 220 telegrams a day—110 sent and 110 received. There was an incentive for every telegram sent or received above that," reminisces Suranchal. Star performers often typed out more than 1,200 telegrams in a day. But once traffic dropped, employees such as Suranchal were reassigned. What makes the downturn even more painful for Gopinath is the fact that even in the face of this steady decline, efforts to improve technology and service have continued. In 1981, the Indian telegraph system adopted the store and forward transmission (SFT) system and then in the early 1990s, the store and forward message switching system (SFMSS). The SFT appended a destination code to telegrams so that they could be relayed without human intervention. Later, the SFMSS removed dependence on physical wired links by using overhead transmission towers, set up 40km apart. “In the case where the telegram had to reach smaller towns, the message would be transmitted overhead as far as it could go, and then it would be transferred on to the underground wires, most of which existed from the pre-independence era, along railway tracks," Gopinath explains. Gopinath recalls that a single scathing article in The Hindu newspaper in the 1980s was enough to jolt the department into action and in 1986, it started taking steps towards modernization and customer service. “We started monitoring the quality of service in 1986, how many telegrams are delivered in 12 hours. It grew from 42% to 97% with modernization, in a span of three years," he says. And even today, when the telegram is largely overlooked as a means of communication, the department continues to innovate. In November 2006, the Web-based telegraphy message system (WTMS) was developed. In an odd case of modern-meeting-ancient, WTMS uses the Internet for fast and accurate delivery of messages. “Today, 17 out of the 25 telegraph zones use WTMS through our server in Trivandrum (now called Thiruvananthapuram) and we are working on a backup server in Ernakulam," says Sinha. Unfortunately, these innovations haven’t grabbed the public’s imagination. Which could also be the reason why there aren’t too many customer complaints any more. For many in the telegraph department, the number of complaints indicates the demand and use of the system. And given that the numbers are declining, for some employees, it is a sign that the service is a “sinking ship". “The decline mainly started in the early 1990s, when the Internet was introduced in India, fast followed by mobile phones. Who would want to send telegrams when all they had to do was send an SMS or make a quick phone call?" says Sudhira Sabharwal, senior officer, BSNL (Bharat Sanchar Nigam Ltd) corporate office. Gopinath, however, prefers to pin the blame on the rivalry between the telephone and telegraph departments. According to Gopinath, the telephone department took all the new developments of non-voice services such as fax, data communications, video text services etc, under its purview, leaving the telegraph with no option to diversify. Even a feeble attempt by the department to start Express Money Service was stopped after a trial period of a couple of years. “We introduced the service, which was an idea that was later taken up by Western Union Money Transfer Service. In 6 hours time, we would deliver the money; otherwise, we used to refund the commission charges. The telephone people didn’t allow us to sustain that." After Sam G. Pitroda became C-Dot (Centre for Development of Telematics) chairman in 1984, he and G.B. Meemamsi, executive director of C-Dot, developed the electronic digital telephone switch, which improved telephone services tremendously. This compounded problems for the telegraph services. Many believe the separation of the postal and telegraph services in the early 1990s worsened things. Till this bifurcation, telegrams were received at post offices and then delivered to the recipient by post. “In their last estimate, the postal service demanded Rs56 as just agency charges to handle a single telegram." Sabharwal says. Compare this with the pittance the department charges for a telegram. Minimim telegraph charges were last revised in 1983 to Rs3.50 for a 10-word message. Postal registry charges, says Sabharwal, which were cheaper than telegrams at the time now start from Rs17. General manager Sinha concurs with this view, but says that they are trying to recover losses by procuring government subsidy under the Universal Service Obligation Fund (Usof). Set up by the government in 2002 to fund communication in rural areas, since these are largely overlooked by market players, Usof revenues come from charging telecom operators 5% of their annual income. “This is an essential service, and so we sent a request for the subsidy in April. We are awaiting an answer," Sinha explains. The telegraph department currently posts a loss of around Rs250 crore a year. Also, from the current 4,000 offices, the department plans to scale down to 1,000 offices within the next couple of years. The number could be reduced even further. The department had a staff strength of 35,000 at one time, but with direct recruitment being stopped in 1984, most employees are nearing retirement. “We will have people in the department till 2015… I don’t know after that. Maybe it will be time to close down the service by then," says Sinha. Despite the bleak outlook, Gopinath remains optimistic. He says that if one values the real estate assets owned by the telegraph department, no one would call it a loss-making body. “We have prime land and bungalows in all the major cities in the country. If we were to simply rent this land and the bungalows out, the department can post profits in lakhs and crores," he contends. Much of this real estate, however, has been taken over by the telephone department as part of the decades of consolidation, de-mergers and mergers in the communication services. Currently, the telegraph system seems to be surviving only on a sense of obligation to the poor man, and a belief that it, being a government service, still holds some sanctity in the mind of the common man. Gopinath remembers a time when the telegraph system made some inadvertent blunders. “In the 1970s, we once sent a telegram meant for Mount Abu to Abu Dhabi. And then a message that should have gone to Belgaum landed up in Belgium." The veteran’s anecdote of choice however is the time a maharaja wired for his ‘darbar’, asking to be receive at the railway station. Instead the royal highness found his ‘barber’ waiting for him. 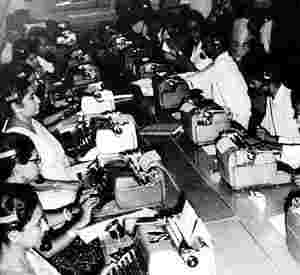 Suranchal, on her part, remembers the office atmosphere during the late 1980s and early 1990s as being “very noisy, with the collective sharp sound of the telegraph keys being struck from every corner of the central office". Today, Delhi CTO is a quiet place by day and virtually empty at night. “Only one or two people sit here now in the night shift," says sub-divisional engineer A.S. Chauhan. The pony-tailed Chauhan says there was a time when 300 people used to work in the office day and night. The introduction to Krishnalal Shridharani’s 1953 chronicle of the first 100 years of the Indian telegraph was written by Jagjivan Ram, then minister for communications. In it, he pays rich tribute to the tireless efforts of the employees to build the network over areas that are “difficult and impassable in jungle and hill areas". His introduction closes with the lines: “The future of communications in India, therefore, lies in not only making all Indian citizens more comfortable and informed but also making them more vital representatives of … the Indian genius." That future, however, has little place for the humble and hardy telegraph. The Indian genius has moved on. The story of the Indian telegraph is one rich with personalities. From governer-general Lord Dalhousie, who unilaterally sourced funding for the first telegraph line in 1851, to the hundreds upon hundreds of workers who strung wires and built towers up and down the length and breadth of the country. But standing tall over all these people is William Brooke O’Shaughnessy, the enterprising Irishman whose life was marked by several innovations, including the Indian telegraph. O’Shaughnessy would overcome birth into a poor family—in 1809—by excelling in his studies and winning a seat at the prestigious University of Edinburgh. He graduated in medicine in 1829 and then, failing to win a licence to practise, opened a private forensic toxicology laboratory. The doctor’s first brush with fame came in 1831, when he published a landmark letter in The Lancet, the medical journal, outlining the results of his tests on blood samples from cholera victims. O’Shaughnessy suggested that cholera patients suffered from extreme dehydration and lack of salts in their blood. A more detailed paper would follow that would revolutionize treatment of the disease. Today’s commonplace practice of using rehydration salts to revive severe diarrhoea patients can be traced to O’Shaughnessy’s pioneering work. The doctor’s good work eventually earned him an invitation to join the Bengal Army in Kolkata in 1833 as an assistant surgeon and subsequently, as a professor at the Calcutta Medical College. Six years later, the doctor would make his next landmark medical discovery. During a meeting of the Medical and Physical Society of Calcutta in 1839, O’Shaughnessy read out his paper, On the Preparations of the Indian Hemp, or Gunjah. In 1841, during a brief trip back to England, the doctor took back with him samples of hemp to be planted at the Royal Botanical Gardens at Kew. Once again, the medical profession took note. Hemp was heralded as a wonder drug and physicians on both sides of the Atlantic experimented with concoctions made from cannabis. When O’Shaughnessy returned to India in 1844, it was as a Fellow of the Royal Society. With two key discoveries and several medical textbooks behind him, he then focused on his non-medical pursuits. While an official career move meant that O’Shaughnessy was now assay master at the Kolkata mint in charge of developing a single system of coinage in India, he also dabbled in telegraphy on the side. His efforts would bear fruit in 1851, when he was officially asked to lay an experimental telegraph line, the first in the country, between Kolkata and Diamond Harbour. It was a success and the doctor was made the first superintendent-general of telegraphs. In just the first two years, under the doctor’s watch, more than 4,000 miles of line was laid. O’Shaughnessy was knighted by Queen Victoria in 1856. The doctor finally left Indian shores in 1860, retired from the medical services in 1862 and disappeared from public eye. He died on 22 January 1892.